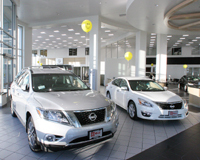 The Mills Automotive Center is your Buick, Toyota and Nissan dealer in Willmar. New, used and factory certified vehicles, and reliable vehicle maintenance / repair services. On Hwy 71 just south of the junction of Hwy 23 and Hwy 71, across from Mills Ford Chrysler.